I'm thinking... this is my kind of dish. A pasta dish bursting with lots of color and flavor. Yes, I will admit I'm a pasta girl. My husband thinks I might have some sort of vitamin deficiency with all my starch cravings. Nah, I just love me some carbs. Cavatappi shaped pasta has to my favorite shape too. It's nooks seem to trap all the yummy flavors you add to it, making my tummy very happy! Heat olive oil in a non stick skillet over med-high. In a storage size ziplock bag put breadcrumbs, 1/2 of parmesan cheese and salt and pepper. Mix all together. After you have pounded your chicken very thin, place them in your zip lock baggie and shake all the bag around till the chicken is coated. In a shallow dish, beat one egg. Take each piece of chicken and dredge in egg, then back into the baggie for a second coating of breadcrumbs. Place all the chicken in your hot skillet with oil. Fry on both sides until golden brown. About 3 minutes each. At the last minute sprinkle the rest of the parmesan cheese over the top of the chicken breasts. Let melt then place chicken on a plate and set aside. Microwave your chicken for 2 minutes when your pasta is finished, so it is warm to serve. Cook your pasta till al dente, drain, rinse and set aside. Chop your garlic, and tomatoes (tomatoes in big chunks) slice your mushrooms. Dump your noodles into the same skillet you cooked your chicken in and toss on medium high heat. Add pesto and garlic mix throughly. Let the pasta get real hot, almost searing the noodles. Add the tomatoes, mushrooms, and wine. Cook for about 5 minutes. Right at the end add heavy cream and parmesan mix all together. 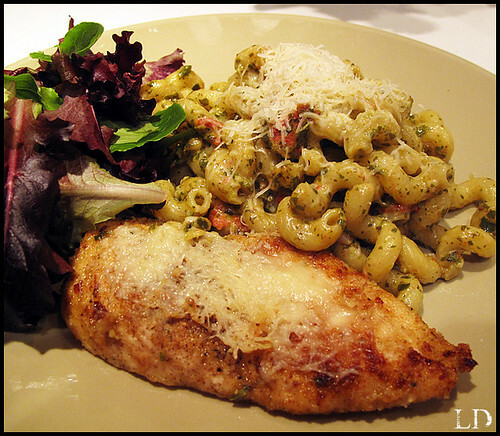 Serve hot with parmesan chicken. We are having company on Tuesday night so I think I will try this, it sounds so good.